There has been very little sleep to be had in this house the past few days. Thankfully I can crochet the "granny stitch" in my sleep and without looking so I've been making a bit of progress. These photos are actually a day old and I've already added a whole new color block to the shawl today. I often get asked how I have the time to crochet. I have a crawling baby, volunteer work, lots to do. I think I just prioritize crochet over housework more often than I probably should. I also don't spend time on a smartphone while I'm out so if the wee one falls asleep on a car trip I can sneak in a few minutes of crochet in the parking lot instead of surfing Facebook. 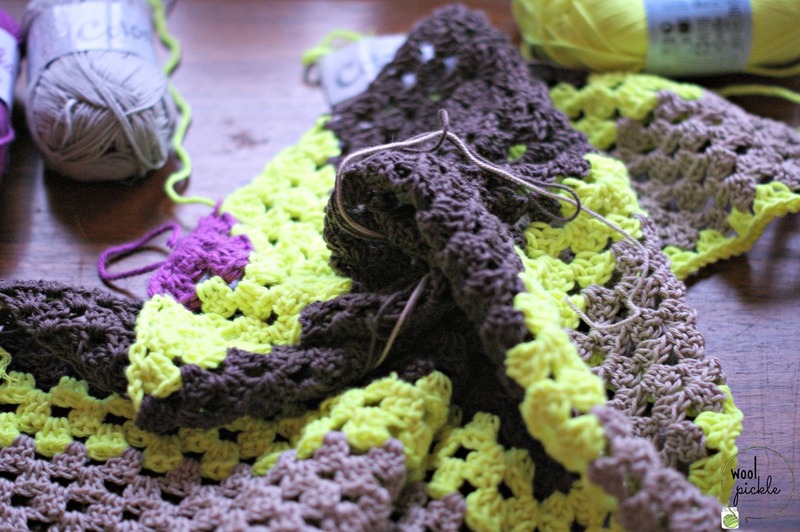 Crochet time sneaks into the little spare moments that happen here and there. I can't seem to manage any complicated patterns anymore with the sleep deprivation and baby chasing. But the colors make me happy and I suppose that's enough for right now. There isn't much that I have control over in my life at the moment and while that's frustrating it's also a good exercise in letting go. This is one of the first shawls that I've come at with a game plan (albeit a rough one) but the plan entails a lot of letting the yarn show me what it wants. You can see how much I've had left of each skein at the end of the color blocks. Just a tad. It has me rushing through the last row wondering "will I make it? Will I have to frog this whole row?". Letting go. I could get better at that.